Do Chicken Breasts Deserve Their Bad Rap? Yeah, I know. As a food writer, I’m supposed to bash chicken breasts. So when it comes to the dark meat versus white debate, almost invariably I bang the drum for dark. Dark meat has more fat, which gives it more flavor and makes it less likely to dry out on the grill. Oh, and it’s a lot more economical that breast meat. Which is why, as you travel the world’s barbecue trail, nine grill masters out of ten prefer dark meat. Call me an iconoclast, but I actually like to grill chicken breasts. Not always, but often. I appreciate their neutrality—a blank canvas, as it were, on which to impose the flavors from the world’s most vibrant food cultures. I also like the convenience—especially after a busy day. You can season, grill, and serve a chicken breast in less time than it takes to preheat the grill. 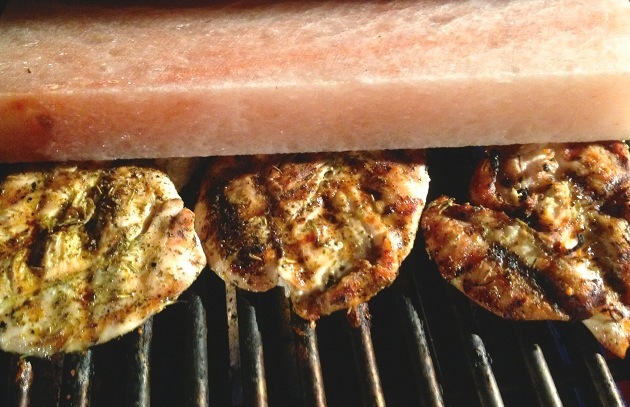 The challenge is this: How do you grill chicken breasts without drying them out? Direct grilling, of course, is inherently a dry cooking method. It intensifies flavor, but it also tends to desiccate leaner proteins. But grilled chicken breasts don’t have to be dry. Over the years, I’ve developed five strategies guaranteed to keep your chicken breast moist, however hot your fire. Brine: More than any cut of protein, chicken breasts benefit from a one- to two-hour soak in brine, which uncoils their tightly-wound proteins (like that after work martini) and adds as much as 10 percent moisture to their cells. At its simplest, a brine can be one tablespoon of kosher salt to one cup of water. But sugar and other seasonings make the brine even tastier. Soak in buttermilk: Take a cue from Southern fried chicken masters and soak the chicken breast in buttermilk. This tenderizes the meat and keeps it moist during grilling thanks to the buttermilk’s combination of acid, enzymes, and calcium. Elsewhere on Planet Barbecue (in the Middle Eastern and India for example), grill masters use yogurt instead of buttermilk. Tandoori chicken is a prime example. Butterfly the breasts (this works especially well with thicker ones) before cooking by slicing lengthwise through the thickest side to the opposite side. Open up like a book. Divide and conquer: Thinly slice the breasts on a sharp diagonal across the grain into strips. (This works best if the chicken is partially frozen.) Thread accordion-like onto bamboo skewers to make Asian-style sates or kebabs. Full court press: Get theatrical and grill boneless chicken breasts under a grill press, foil-covered brick, cast iron skillet, or salt slab. This technique not only compacts the meat, which gives it better texture and killer grill marks, but it blocks the escape of moisture and hastens cooking. Don’t overcook: This transgression has contributed more to chicken breasts’ poor reputation than any other. Don’t desert your grill when cooking this delicate meat, and learn how to determine when it’s done (165 degrees). For thicker breasts—especially skin-on, bone-in breasts—rely on a digital meat thermometer or use the poke test. Note: insert it through the side of the chicken, not, through the top. Thinner breast meat—such as butterflied breasts, paillards, or sates—will cook in a matter of minutes.